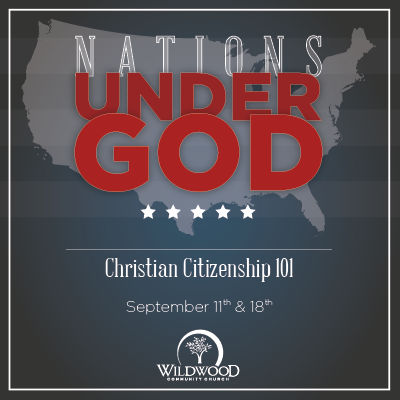 On Sunday, September 18, 2016 at Wildwood Community Church, I preached part 2 of the “Nations Under God” series. Below you will find a set of questions related to the message for personal reflection or group discussion. In the message today, we talked about how God has provided a few restraints in the world concerning sin: the conscience, the family, the church, and the government. In what way do you see these forces restraining sin in our world today? In response to the “gift of government” and in recognition of its authority (given by God), Christians are called to be model citizens, honor government officials, and pray for government officials. What are some practical ways you can apply these commands in your life today? What are some examples (you can imagine) where the government might require Christians to not do something He has commanded us to do, or require us to do something He forbids? How does it encourage you that Jesus is building His Kingdom, and the gates of hell will not prevail against it? Are you making God your “fortress”? How can you apply this message this week?